ST. GEORGE — Several homes were evacuated along the Santa Clara River in Brookside amid daylong rains that prompted a flash flood warning Wednesday for much of Washington County. The National Weather Service issued the warning, which extends to 7:30 a.m. Thursday as rainfall and snow melt in Washington County add to the Santa Clara and Virgin rivers. According to the NWS, widespread rainfall of 1 to 2 inches had fallen across the area, with an additional 1/2 inch to 1 inch possible. High water and flooding on the many small streams and tributaries leading into the Santa Clara and Virgin rivers is to be expected. Water will also be running high and fast on the Virgin and Santa Clara rivers through the night. High running water will not start to recede until Thursday morning. 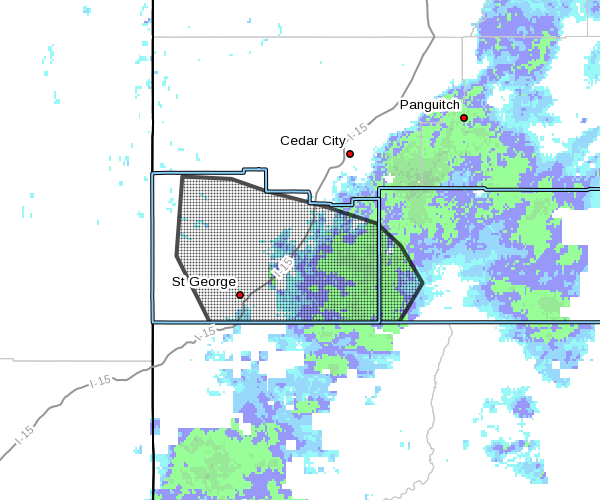 Low lying areas near the Virgin River in the towns of Virgin and Washington City will be especially susceptible to flooding. Locations that may experience flooding also include: St George, Washington City, Hurricane, Santa Clara, LaVerkin, New Harmony, Zion National Park, Ivins, Hildale, Enterprise, Toquerville, Leeds, Virgin, Springdale, Rockville, Pintura, Bloomington, Pinto, Pine Valley, Gunlock, Veyp, Snow Canyon State Park and Goldstrike. Frank Bristolfo, of the Brookside Fire Department, said several homes in the Brookside community along the Santa Clara River had flooded and that some home evacuations had occurred. “There’s a lot of sandbagging going on right now,” Bristolfo said early Wednesday evening, adding that the other area fire departments were aiding in place sandbags around at-risk homes. Remain alert for flooding even in locations not receiving rain. Streams, rivers, and normally dry washes can become raging killer currents in a matter of minutes, even from distant rainfall.